What Is the Best Mattress for Pregnant Women? Home Blog What Is the Best Mattress for Pregnant Women? Pregnant women face an uphill battle when trying to get a good night’s rest. Hormonal changes cause them to wake frequently. Body changes cause aches and pains all over as ligaments stretch to accommodate a growing baby. Emotional changes and new anxieties make it harder to peacefully drift off. Then add common conditions like heart burn, restless leg syndrome and sleep apnea on top of all that. It’s not surprising that one poll found 78% of pregnant women admitted difficulty sleeping. So as you shop for all your baby nursery supplies, why not treat yourself to a new mattress? Some of the newer features of quality brand mattresses specifically appeal to the needs of pregnant women to offer a more restful slumber. Natural materials: Despite consumer interest in healthy, eco-friendly products, many mattresses are still made with petrochemicals, noxious adhesives, pesticides, chemical flame retardants, and more. Volatile Organic Compounds have been linked with cancer, organ damage, and endocrine disruption, says Mattress Inquirer. They add that people with allergies and breathing problems, as well as pregnant women, particularly should avoid mattresses containing toxins. The best alternative is Oeko-Tex 100 certified, 100% natural organic latex, which is made from tree sap. Ideally, they say, you want to shop for a mattress free from any harmful chemical additives, which features “organic cotton covers, wool fire barriers, and unglued layers.” OMI Naturals is a brand we personally recommend for people who want the purest mattress possible. Cooling Technology: Night sweats are caused by hormonal imbalances during pregnancy that affect more than half of all pregnant women, according to Today’s Parent. One common complaint of the older memory foam mattresses were that they “slept hot.” That is not the case with high-end memory foam mattresses today. Brands like Sealy, Simmons and Stearns & Foster feature special cooling technology to keep airflow circulating so you don’t get too hot during the night. Sleep Like The Dead found that firmer mattresses were less hot. They also recommend that hot sleepers look for low-density memory foams, gel foam, moisture-wicking covers, and latex foam hybrids. Memory foam: According to WebMD, pregnant women should sleep on their left side to improve circulation of nutrient-packed blood from the heart to the placenta and to prevent expanding body weight from pushing down too hard on the liver. A layer of memory foam on top of your mattress will provide a softer surface for side sleeping. Weight distribution: Many people like foam latex or memory foam mattresses because – unlike coil mattresses – they do a better job at reducing motion transfer and distributing weight, so when your partner shifts in bed, you don’t feel it as much, if at all. You also don’t have to worry about feeling as though your body’s struggling to prevent rolling toward your partner. Superior weight distribution is just one of the many ways memory foam or latex mattresses provide a more restful night’s sleep. Firmness: Most pregnant women get up three to five times a night to use the bathroom. If you choose an ultra-soft memory foam bed, getting up could be difficult. A better option would be a medium-firm mattress that retains enough soft comfort layers to take the pressure off your hips and lower back but has enough firmness that you don’t feel like you “sink into” the bed. 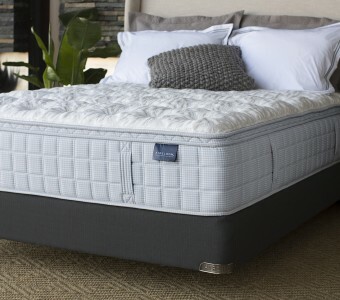 Another great option is to purchase a mattress that is compatible with an adjustable power foundation that can sit you up automatically to get you out as easy as possible. Most modern options have sides that work independently of each other and are whisper-quiet, so you won’t disturb your partner. The Sleep Specialists at Mattress World Northwest are happy to help you find the great night sleep you (and your developing baby) deserve! We offer one of the area’s largest selections of mattress brands at all different price points to best suit your needs. Stop by one of our 12 Portland-area locations for friendly, personalized service from a locally-owned, family-oriented business.